Here we are – the last days of my challenge! 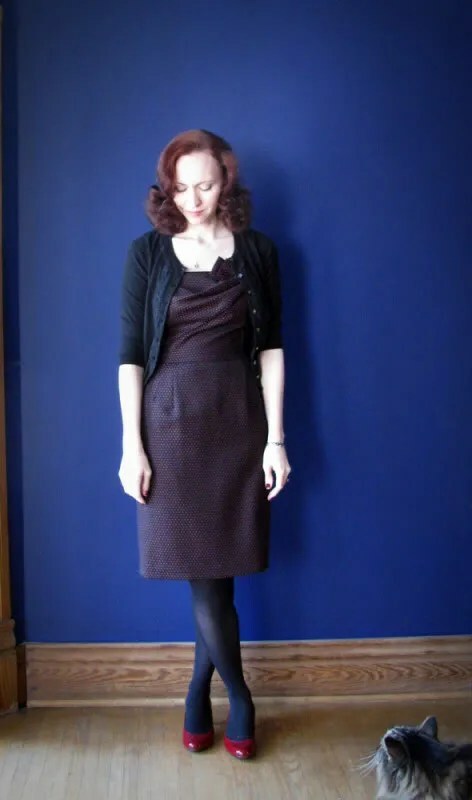 This is the first time I’ve worn this dress – it feels so dressy to me, and I’m not really big on straight skirts. I wore it to my recital, and I feel like it was perfect for that occasion! This is another dress I’m trying to rescue from obscurity. It’s very clingy, which isn’t necessarily bad, but I do tend to feel self-conscious when something clings to my hips. The solution? A long cardigan! 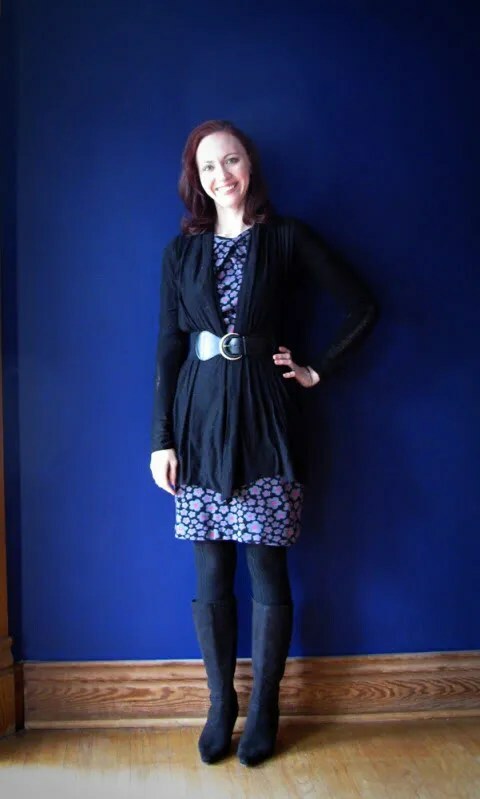 I love this dress – it’s so versatile, and most of all comfortable! 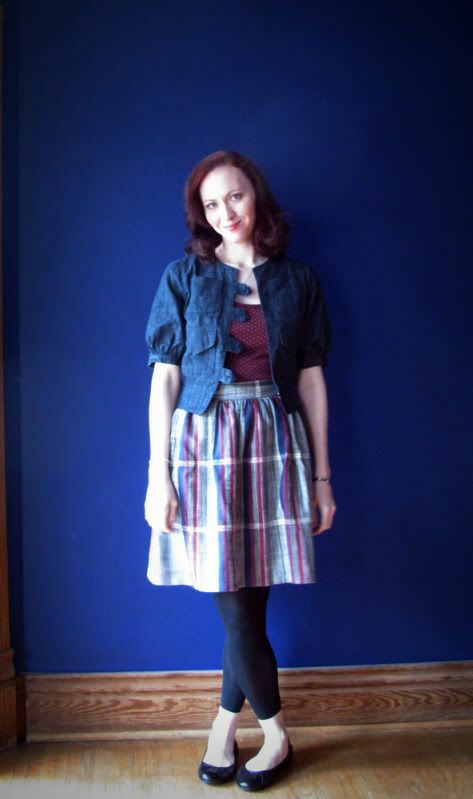 It’s funny- I don’t really love this outfit (I feel like the boxy jacket + full skirt is a bit much) but I got several random compliments on it today! I do love the individual parts. All my photos from the challenge are in my flickr set here. What have I learned from this challenge? 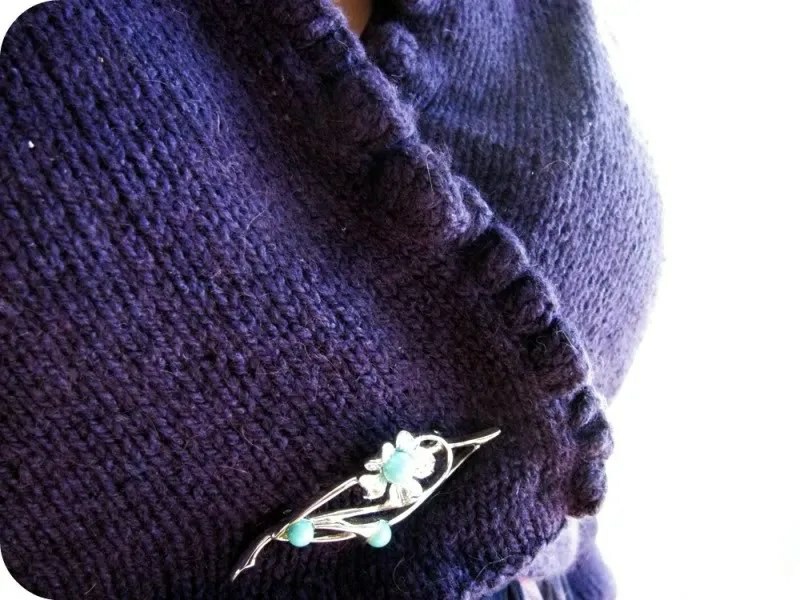 I’ve learned that I actually prefer my handmade items – I did not miss my other closet items a bit! 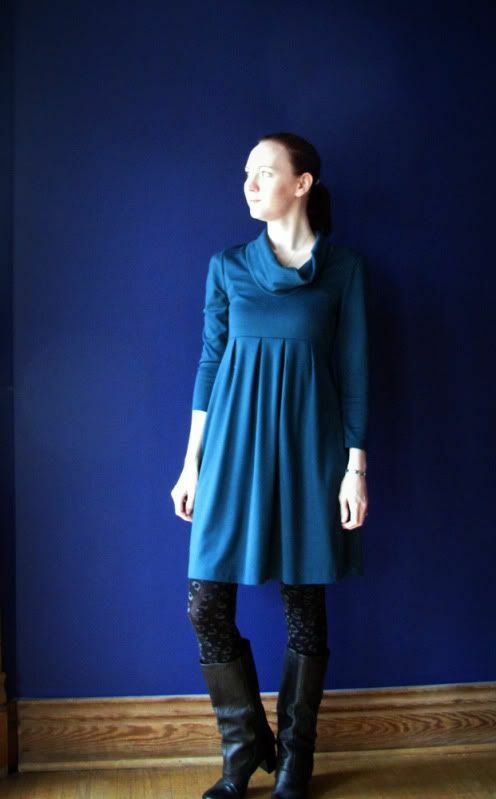 I feel like I’m doing well making items that I want to wear – in particular, I wear a lot of knit dresses, so I’m glad that I’ve hit those hard since the last challenge in September. I’ve worn my knitted items this month, which has inspired me to start knitting again – so excited about that! I can’t really explain to you why I stopped. I think that I associated many of those items with the period of my life when I made them – a time when I was working a job that I hated, when I felt trapped and alone. Now that I am happier, I’ve found it hard to shake the memories. Perhaps those items have finally lost their bad associations for me? I tend to do that… if, for example, I wear a certain perfume during a bad event, I might remember that event and stop wearing the perfume. Of course, I do still have fears for my wrists, so my knitting will be slower, but I’m finally motivated again! 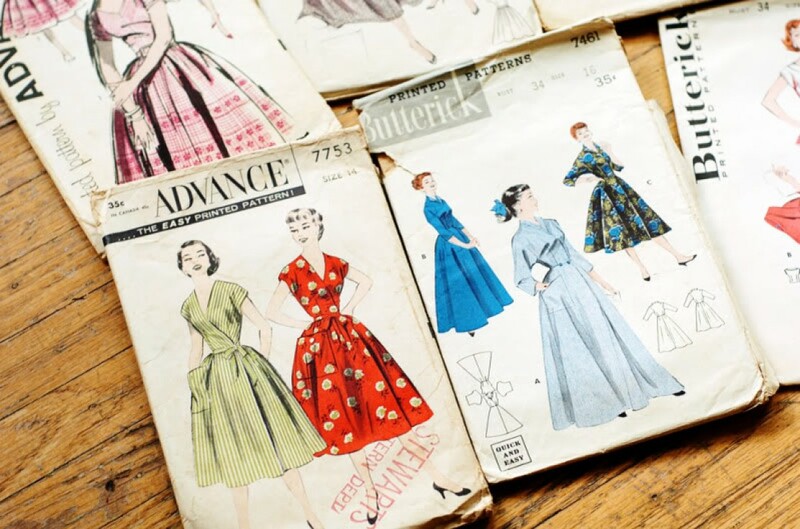 My summer sewing plans include many cute dresses. Self-stitched September was really life-changing for me. I realized that I wasn’t dressing to make myself happy. What makes me happy? Wearing dresses most of the time. Now I do, and getting dressed every day is so fun! 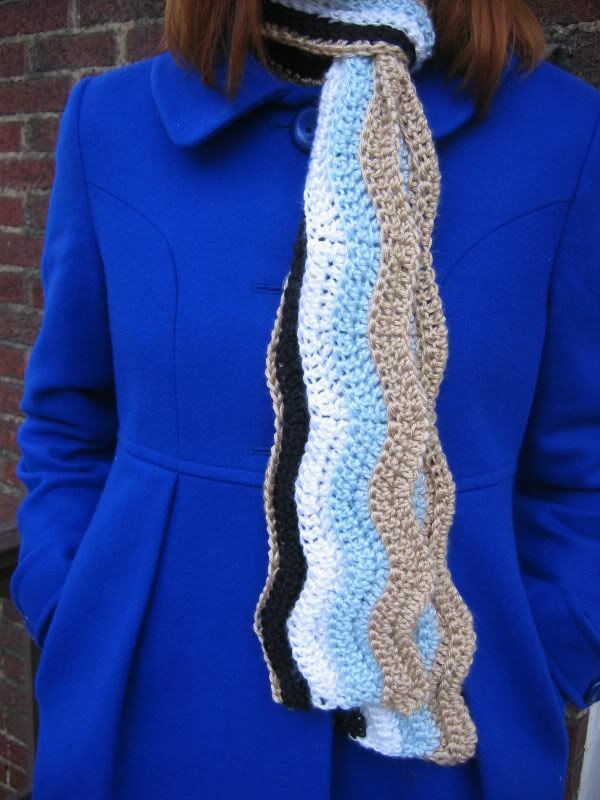 I plan to continue that into warm weather, hopefully making and wearing many cute dresses. I also plan to knit some cardigans – I have many black/neutral cardigans, but not so many colorful ones. I’m on spring break starting today, so I hope to get in some good crafting time. In addition, one of my friends and I are going to do a thrift expedition/clothes swap, so I’m really looking forward to that! Thanks to everyone who has commented – and congratulations to my fellow me-made-March participants. I have enjoyed seeing what you are wearing every day! Clockwise from top left: 1. 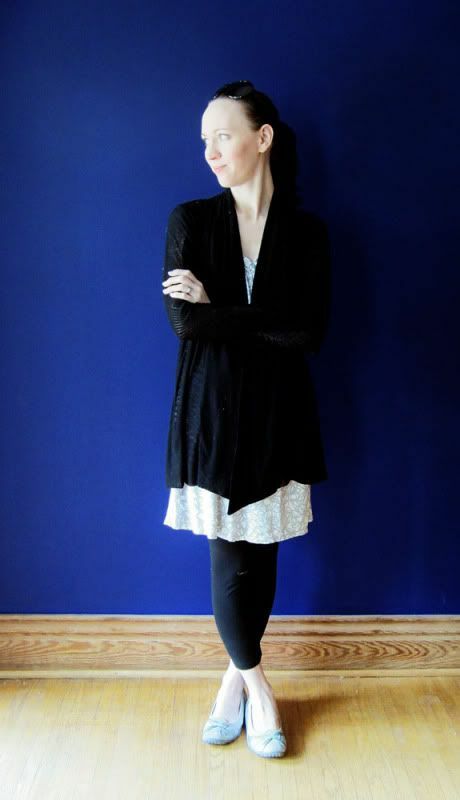 Rayon/lycra knit for Butterick 5491. My obsession with painted looking fabrics continues. 2. 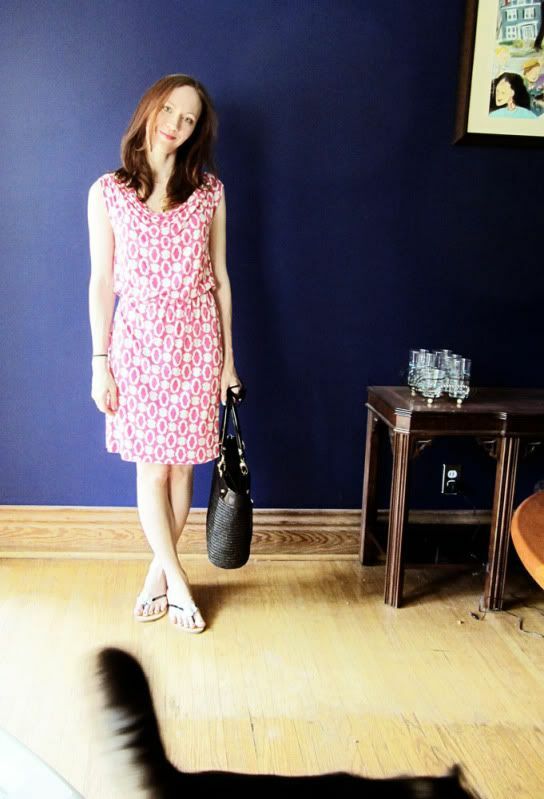 Linen/cotton blend print, to make retro Butterick 5603 (the tie shoulder version.) 3. Poly charmeuse to make the new Vintage Vogue reprint 8728. 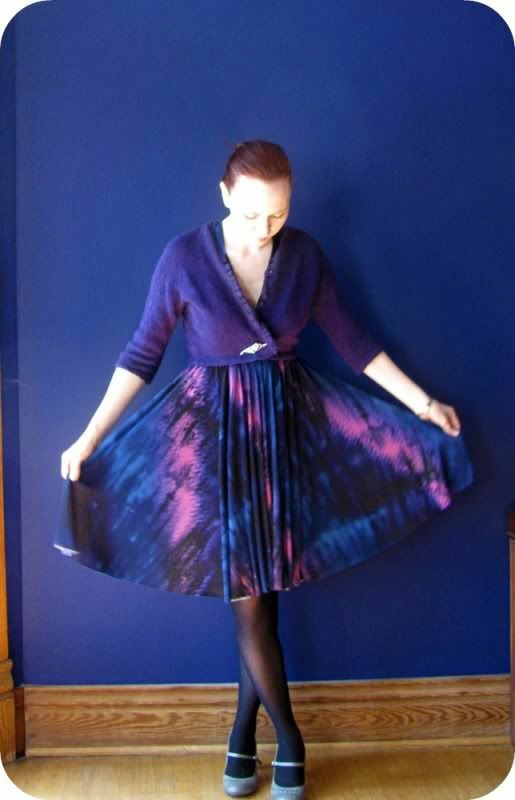 I am not a huge fan of polyester, but I wanted to make this dress cheaply to start out with. 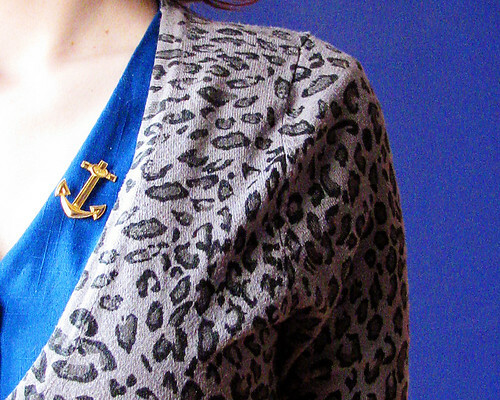 I do love the nautical print! 4. Stretch cotton sateen for DKNY pattern Vogue 1220. 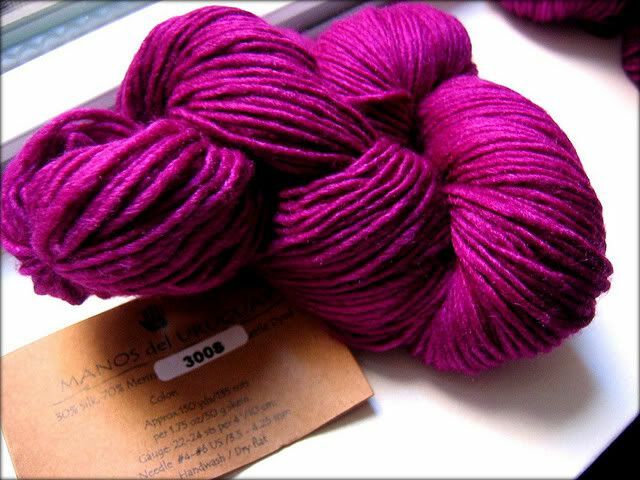 This is Manos wool/silk blend. 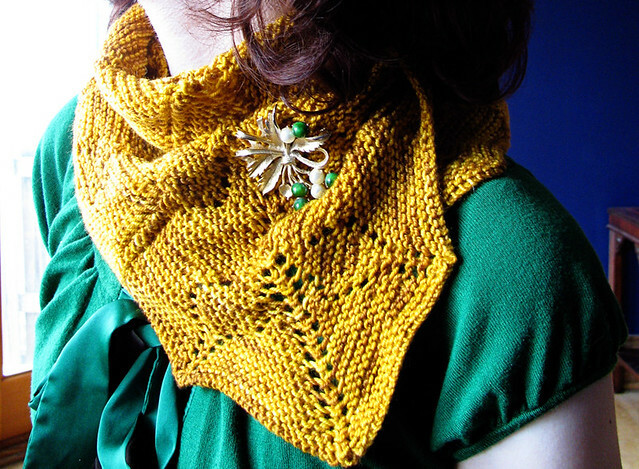 I have part of it knit into a tuscany shawl (which will never be finished) and I’m ready to frog it. I am not totally decided on the pattern, but I’m leaning towards Audrey in Unst. I think it will look great in this color, and I have just the correct amount of yarn. Finally, here is my me-made-March outfit of the day. 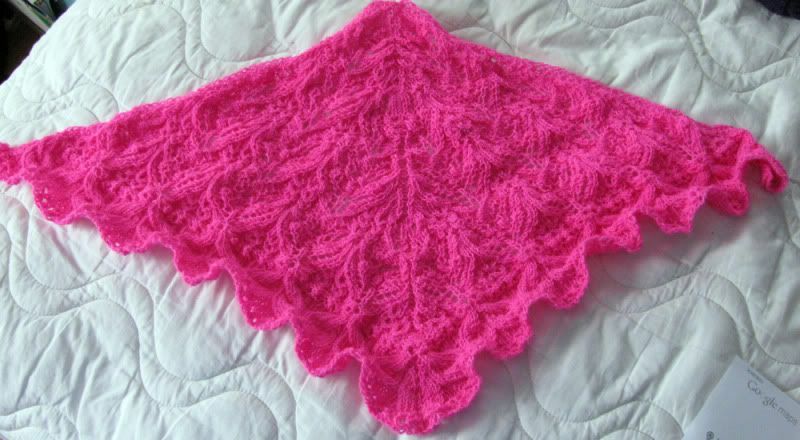 I knit the shawl on size 4 needles (I am a loose knitter.) 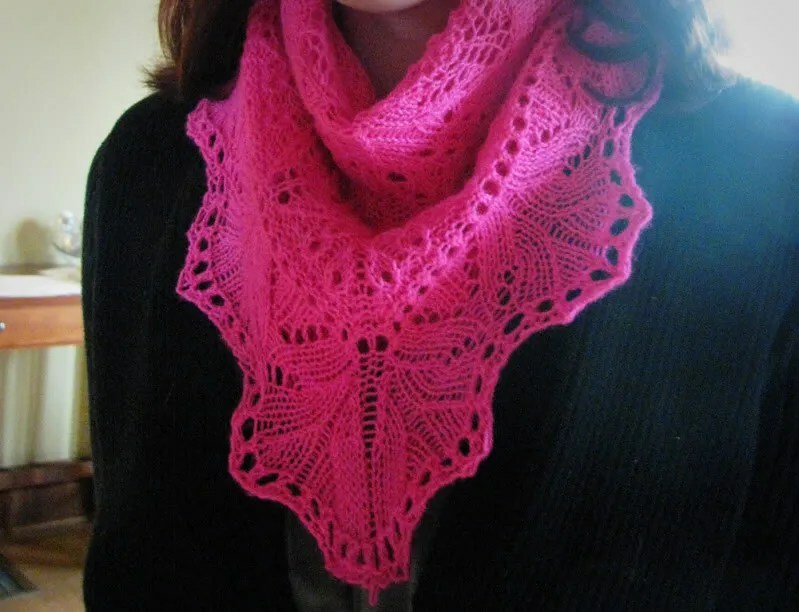 It does require attention, because the entire thing is charted, but I would describe it as pretty low stress for lace knitting. 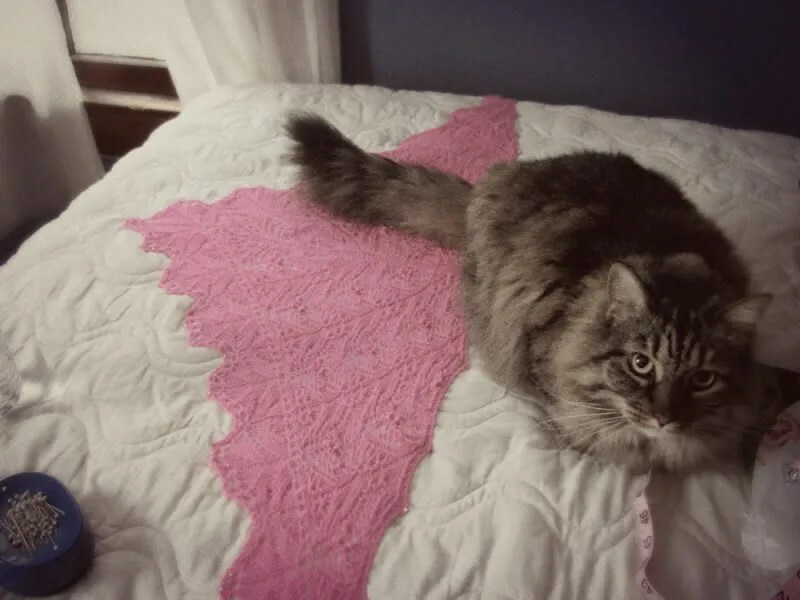 I didn’t get it to block into pretty scallops because I was trying to stretch it larger. I may reblock it without pins – I’m not thrilled with the points. 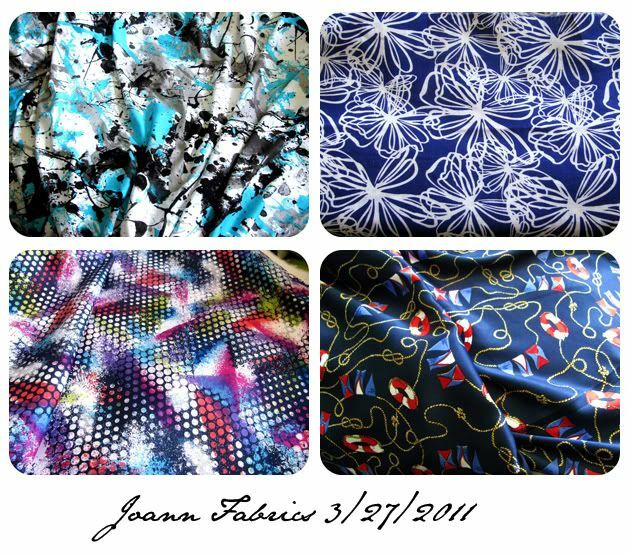 I have no exciting weekend plans other than sewing – yes, we are social animals around here! I have my studio recital on Monday night, so I’m putting a lot of time and energy into preparing for that. Recitals are stressful, and I will be glad when it’s over! 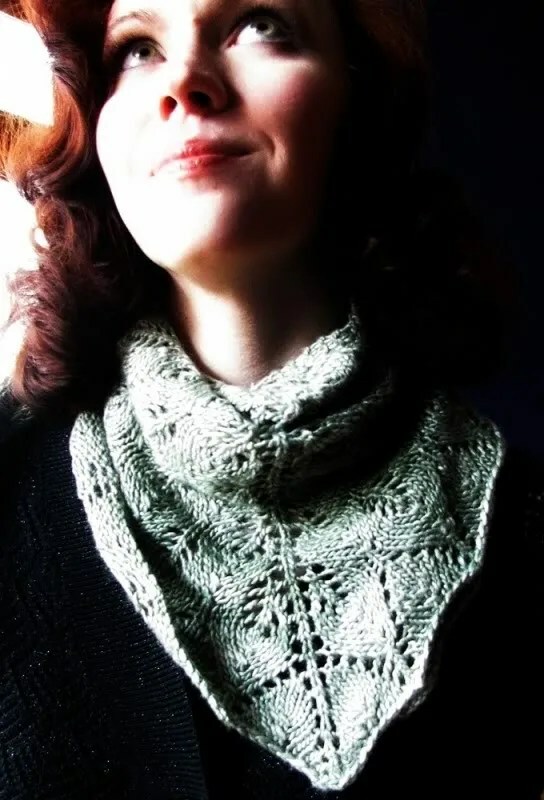 Shawl: Shetland Triangle by Evelyn A. Clark. 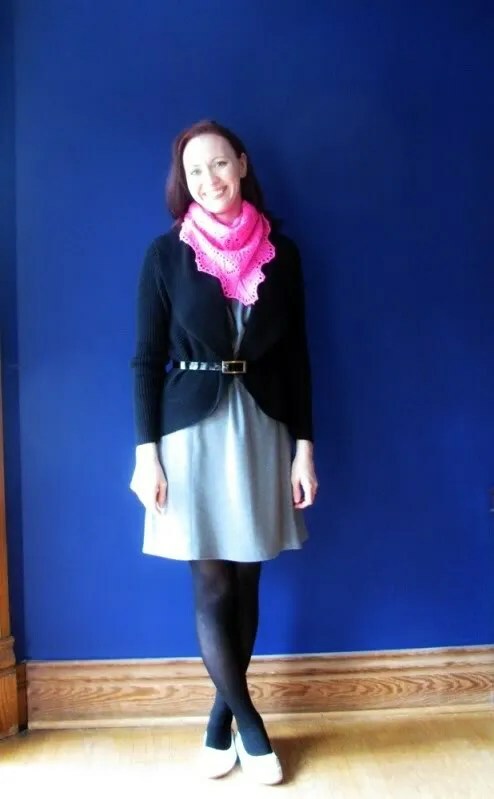 I knit this quite awhile ago – the photos on my Ravelry page are from before we bought our house! The rest of my outfit is not exciting – today I have a concert, so it’s all black again. I’m not great at blocking shawls, I know I don’t use enough pins or worry about things being perfectly even. What’s the use, when I know it’s going to get many layers of cat hair on it while its wet? Leon would like you to know that he is definitely not thinking about laying on that the second my back is turned… no sir. What is it with cats and wet things? Is it only my cat? He loves to sleep on blocking sweaters more than just about anything! I’m finally back on track with me-made March. One thing I really enjoy about the challenge is that it gets me to wear my less worn projects. I don’t wear this dress often – it used to make me feel costumey (though not anymore… I am used to it at this point) and it attracts lint like mad. I bought this sweater thinking I would never use it, but I wear it all the time. It’s the perfect length for me, though I suspect it might be cropped on someone with a normal length waist. I am so ready for spring now. Today it is in the 70s! The temperatures are going to go back down later this week, so I’m enjoying them while they last. 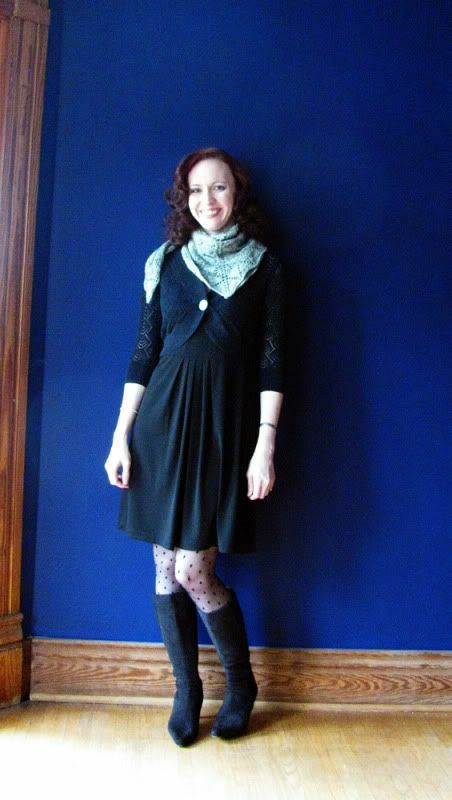 It’s so nice to be out of tights – I don’t mind wearing them, but after awhile it gets a bit monotonous! I even ordered a pair of shoes to wear this spring. 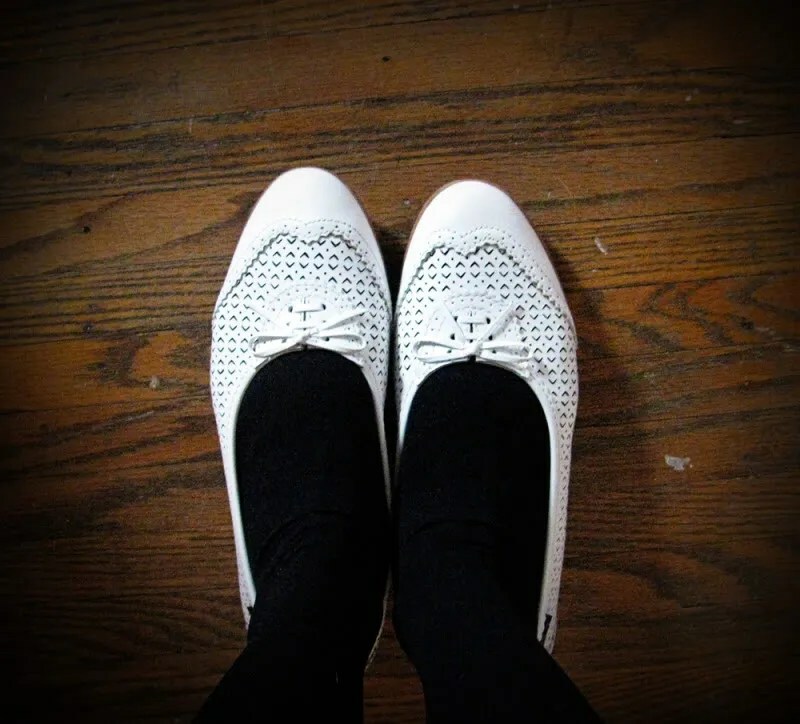 I got the white color, and I’m anticipating them being nice with full skirts, similar to an oxford but more flattering on the leg. This is what my hair looks like on the second day of a set of Caruso steam rollers. I started using them in high school, but forgot about them for years. I saw them a bit back at Sally’s and got a new set. I love them – my hair is very fine and mostly straight (I have a little wave underneath.) These work almost as well as a wet set, but I don’t have to sleep in them. I highly recommend them! Today one of my piano students said to me “why do you always wear weird things?” I’m not really certain what would be considered “weird” by an elementary school student, but apparently it involves tiny shawls. I think, all things considered, that I will take the fashion opinions of 7 year old boys with a grain of salt, yes? I’m pretty sure I wouldn’t use this yarn for another shawl. It’s very pretty, but it’s so springy and tightly wound that it refuses to hold blocking, especially in the garter stitch. Even so, I’ve worn this quite a bit. I hope to wear my damask shawl as much. I am on row 54. The great thing about the pattern is that it is knit starting with the long edge, so it gets shorter every row! 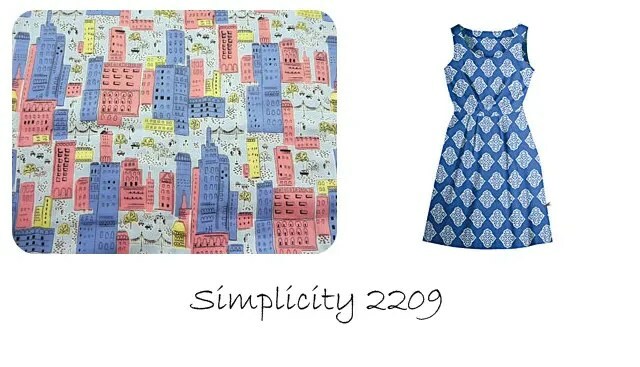 Simplicity 2209 is one of the new Lisette patterns from Simplicity. The designer kindly sent me one to try, and I thought it would be perfect for this fun cotton sateen print (from Sawyer brook, still available.) I was looking for a design without princess seams, so hopefully this one will suit the fabric!